ARE YOU ARE LOOKING FOR A FANTASTIC PARTY WHICH IS FULL OF FUN & LAUGHTER? YOU HAVE COME TO THE RIGHT PLACE! 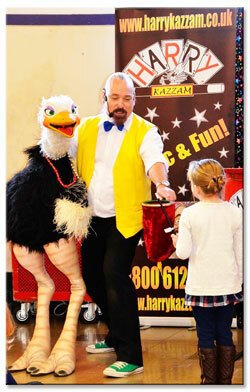 Harry Kazzam has entertained thousands of children over seventeen years, creating stress free parties full of magic, mayhem, sillyness and joy!. NOW BASED IN NEW MILTON, Hampshire, Harry Kazzam is available throughout most of the SOUTH OF ENGLAND. Still taking bookings and enjoying lots of time in CORNWALL. Really really enjoyed Harry Kazzam on Saturday with my two daughters at a friends party! Great fun had by all! Highly recommended! Big thank you for doing Addison's birthday party. All the kids are still raving about it at school and the parents were all impressed to. Even my Dad wants to book you for his own birthday ha ha. Best kids birthday ever!!!! !